Note: Today we publish the third of six finalists’ essays from our 2012 writing competition, “How did you learn to cook?” At Savoring Kentucky, we were particularly taken with the sweet story in paragraph three, with its premise that freedom makes for great cooking. Karen Slaymaker is Assistant Director for International Student Services at the University of Kentucky. She co-chairs the campus-wide Cultural Diversity Committee, which organizes the UK Cultural Diversity Festival, presented for the 23rd time in February, 2012. I learned to cook in Japan where most home chefs never use recipes. Before moving to Japan in my early twenties I enjoyed baking but considered myself a beginner at constructing meals. 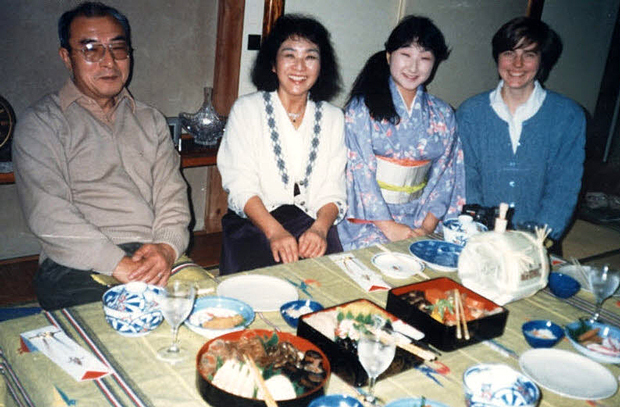 In the kitchen, my Japanese teachers instilled in me a passion for making the meal look as beautiful as it tastes. This meant focusing on various colors and textures so the experience of a delicious meal begins with your eyes. I was raised in rural Pennsylvania where meals were planned around the featured meat. In Japan I learned that most meal planning begins with rice and then meat, fish or tofu are just one part of the meal. When I lived in Tokyo I was fortunate to have several vegetable stands in my neighborhood where I shopped on a daily basis. Meal planning began with the vegetables available today. I became so aware of cooking seasonally–big pots cooking at the table in the winter when we all want to linger around the warm food, cooking the just peeking out of the ground bamboo in the spring, summer is for fresh nashi (Asian pears) that both crunch and ooze juice down your arm when you take your first bite, and fall is the perfect time to make oyako donburi (chicken and egg or parent and child) a favorite at our house. One of the best cooks I ever met told the story of how she became such a good cook just after World War II. Her husband’s father died when he was very young and his mother struggled to work and put food on the table. He really enjoyed home cooking. Together they devised a plan that she would cook dinner every night but if the meal was a failure she would meet her husband at the train station and they would eat at a noodle shop or other small restaurant on their way home. With a spouse who appreciated her cooking, but who also gave her room for failure, she became an incredible cook. One of the first things my best friend, Yasuko, taught me to make was rice. She showed me how to wash the rice over and over again until the water was clear. The most important step was to not let a single grain of rice go down the drain as you washed the rice because others may be hungry. My favorite kitchen tool became my rice cooker which I am still using after more than 20 years. As in most apartments in Tokyo I had two gas burners and a place to grill fish. I learned to make miso soup, grill fish and cook vegetables including Asian eggplants, hakusai, and bamboo. Noodles also play an important role in home cooking – bowls of hot soba, udon and ramen in the winter and plates of cold soba and hiyashi chukka in the summer. I love to teach friends how easy but time consuming it is to make sushi. Our family favorite is temaki sushi where each person constructs and rolls their own sushi. 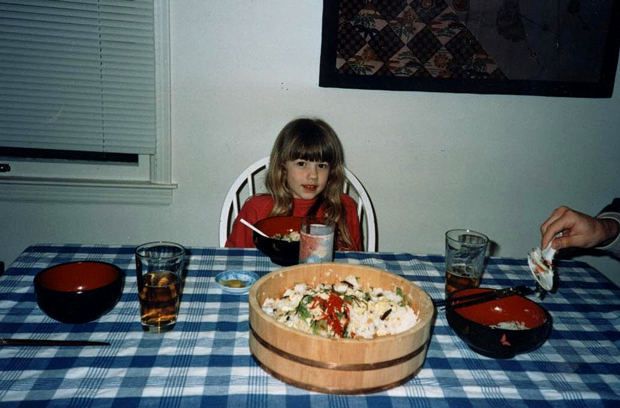 Just this week my daughter, Erika, in Philadelphia called to ask for help in making sushi with her friends. The first thing Erika said after her sushi night was how everyone talked about how beautiful the colors were on the serving plate as they each picked their favorite ingredients. The tradition continues: friends, beautiful ingredients and delicious food.